The all-electric Transit will sit alongside the plug-in hybrid version which will go on sale in late 2019. Ford unveiled a working prototype of the all-electric Transit at a “Go Further” event in Amsterdam, saying the production vehicle would be available in multiple body styles, with a competitive payload and built-in connectivity, delivering full Transit capability and durability. Ford is already involved in a joint project with StreetScooter to provide an all-electric solution targeted at the last-mile delivery sector. The Transit-based StreetScooter WORK XL, assembled at the Ford plant in Cologne, Germany, features an all-electric powertrain and is currently in service with Deutsche Post DHL in Germany. Ford has been running trials of the plug-in hybrid (PHEV) in London. 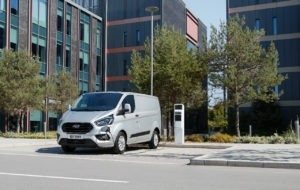 The vehicles front wheels are driven exclusively by an electric motor/generator, powered by a 13.6 kWh lithium-ion battery pack, with Ford’s 1.0-litre EcoBoost petrol engine acting as a range extender. The hybrid powertrain targets a zero-emission driving range of up to 31 miles or 310 miles using the range extender. The company is also developing a predictive usage-based maintenance system which will enable maintenance to be tailored for each vehicle rather being determined by fixed service intervals. “Commercial customers need smarter, more integrated solutions, built around a connected business environment,” said Hans Schep, general manager, commercial vehicles. In January, Ford and Volkswagen agreed an alliance which will involve Ford building medium-sized pick-ups for both companies. Ford intends to engineer and build larger commercial vans for European customers and Volkswagen intends to develop and build a city van.